3500 analyzer has a span width that ranges from 10 kHz to 5 MHz with an effective resolution bandwidth as narrow as 19 Hz. A marker function includes the capability of measuring the power within a particular bandwidth and at a specified offset from the center frequency. 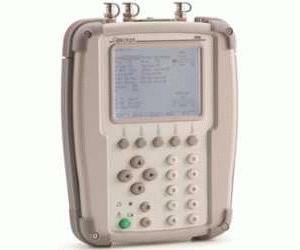 The 3500 Spectrum Analyzer can be accessed from the Transmitter Test screen, the Duplex Test screen, and as a stand-alone spectrum analyzer.